An ensemble of women affected by fistula after successful treatment perform Music, Dance & Drama jointly with local leading artist J.M. 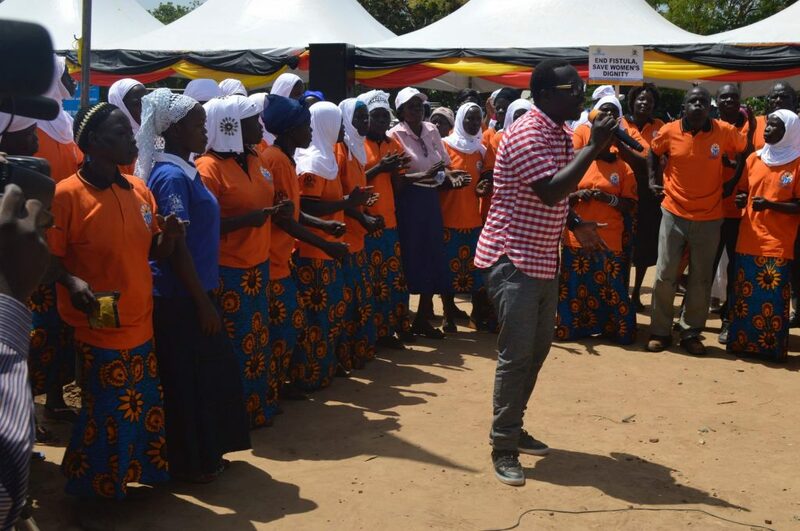 Kennedy during the 4th Annual International Fistula Day on May 23rd, 2016. Our approach to generating awareness around obstetric fistula is cross-cutting. We engage with district authorities, including politicians, technocrats and opinion leaders, to address key emerging community issues using out holistic obstetric fistula program. Our advocacy and awareness work is focused at the district and community level although, occasionally, we engage at the national level. As the voice for the voiceless victims of obstetric fistula, we carefully arrange and take advantage of advocacy and awareness platforms to facilitate those most affected to engage with the duty bearers. We have created deliberate spaces for the empowerment and involvement of vulnerable women in advocacy and awareness. We also extend obstetric fistula, sexual and reproductive rights trainings to law enforcement officers, health professionals, schools, community clubs and members of the media.